Whips and whips There are 7 products. long whip made of high quality brown leather. The total length of the whip is 270 cms. approx. and weighs about 500 grams. It's a long whip is easily operated, essential for recreationists. Tirachines medieval design (24 cm x 8 cm - 175 gr.). The slingshot name because in Spain "Chinese" means "stone". Whip synthetic leather, 180 cms. Whip synthetic leather. Maximum length: 180 cms. 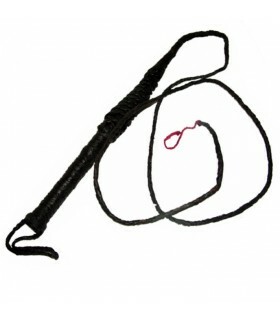 Leather whip (medium). P>A whip is a flexible cord with a fixed handle, usually manufactured from braided leather or other material, it consists of a rod which comes with a strap that comes alive or punishes animals, especially horses. Whips are used to produce a loud sound of azote- or to direct wild animals or livestock. What do we use a whip for? 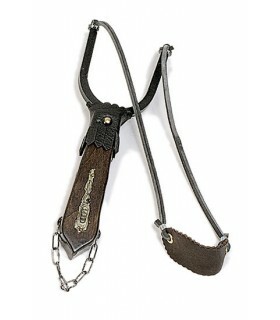 A tool for horseback riding. In Ancient times, it could be used to punish slaves. What is the difference between a whip or a riding whip? Whip: It is shown as a soft rope made of interlaced leather which normally has a huge variety of measures. As it is soft, ican bended easily allowing to make a noise which can scare animals. It is a very useful tool to tame lions, such as Indiana Jones, the archaelogist who has played the main role in a series of films.Throughout History, whip has been part of a list of tools conceived for human beings submission or slaves' dealings. Riding Whip: It is an interlaced leather stick which is (normally) a meter long. When bending can harm considerably, that's why it was mainly used by Knights in their contests but also for taming animals above all horses. We can also appreciate it in flagellation's rituals. We have available a huge number of whips and riding whips in multiple sizes. All of them are made of leather and achieve to reproduce the sound of a classic whip. If you think of a complement for you cow-boy and adventurer costume, you should get one of this. Please consider that if the item you are interested is in stock, we will ship it immediately. Do you have any further question?